I work in a lovely old building that used to be a chemistry building (many decades ago) and now houses humanities types of things. Like many of the buildings on Holland, Michigan, the architecture models a traditional Dutch style. Built from a lovely red-orange brick, this particular building has lovely off white scroll work along the uppermost edges. One day last spring, as school neared its end, on perhaps the first "warm enough to sit outside and draw" day, I did just that: I sat outside and drew. I went out there thinking I'd scribble the whole building, but instead, I really sat and looked at the scrollwork on the top edge. And I drew that. What a lovely thing to do on a spring day! As I sat and really studied the proportions and design of this building that I've seen many times a week for the last 30 years, I appreciated things I'd never noticed before. Like the way the big blocks occurring on the sides and under the eaves are also off-white. How they highlight the white between the bricks, and contrast the red-orange, making it seem even brighter. How the whole thing glows under a brilliant clear blue spring sky. Look at all the color references I made there. Yet the sketch is in black and white! Funny, huh? Looking at the sketch takes me straight back to those moments of intense observation, and I remember many things that aren't even in the actual sketch. 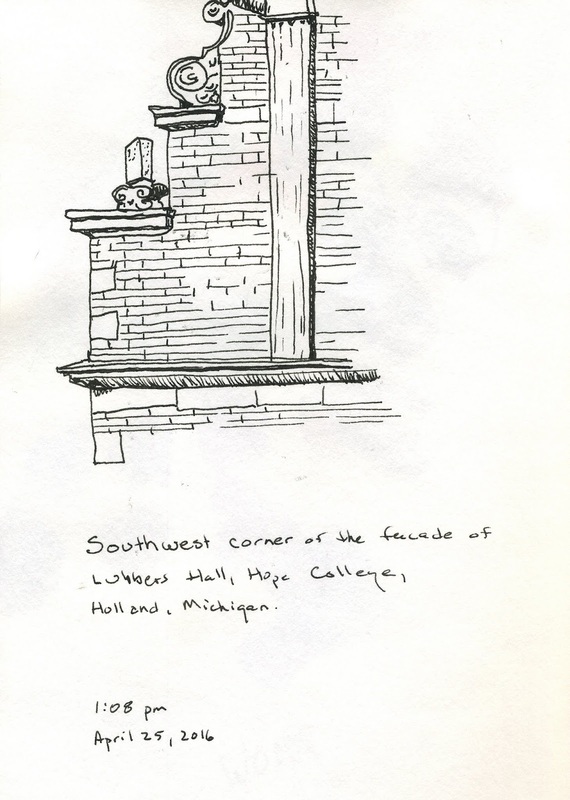 Now that I'm writing about it, in fact, I remember that a student came up to say hi and look at my sketch. Then, instead of heading on, he introduced me to the friend who was with him, and then they hung out with me in the sun, talking about classes while I scribbled away on the bricks. Sketching makes amazing things happen in your head, and your heart. And in the world around you as well. What sort of detail can you notice today on a building you enter and exit many times a week? Try to capture it in a new scribble!